The end of last season culminated in Rick and company winning their battle with Negan and the Saviors. In a one-on-one, hand-to-hand fight, Rick managed to slice Negan’s throat. But rather than finish him off, Rick decided it would be best to lock Negan up, letting him serve as a reminder to the rest, instead of having him live on as a martyr that could potentially rile up the Saviors to fight back in his name. Rick, inspired by his son Carl’s hope for a new beginning, envisions a future where all the camps, Alexandria, the Hilltop, the Kingdom, and yes, even Negan’s people in the Sanctuary, can live and work together to start a new society, government and all. After a time lapse of a year and half, this 9th season began with Rick and Carl’s dream seemingly becoming a reality, with the communities banding together and sharing food and supplies. Despite some expected Savior dissenters, the future did indeed look bright. However, the women of Oceanside were understandibly still angry over certain Saviors slaughtering the men of their community. And as we saw at the end of season 8, Maggie, Daryl and Jesus looked to be plotting against Rick over their unhappiness with Negan still breathing, especially Maggie, whose beloved, Glenn, was murdered before her eyes, and Daryl, who Negan humiliated and had locked up in a cage. This past episode seemed to be bringing that plot to fruition as Maggie headed to Alexandria to have a ‘word’ with Negan, while Daryl attempted to thwart Rick’s efforts to cut her off at the pass. When Rick realized what Daryl was up to, the two had it out, resulting in a tumble into a deep hole, which gave them time to iron out their differences before a bevy of walkers began falling into said hole with them. As the two narrowly escaped with their lives, they departed as brothers once again, Daryl headed to Alexandria to stop Maggie, and Rick headed on horseback to lure away a herd of walkers ambling towards the precious bridge they had been working on. Daryl’s last words to Rick were, “be careful.” Alas, in a world where walkers can arise at every turn, Rick found himself in a dire situation surrounded by the undead with apparently no escaping this time. Is this how Rick Grimes meets his untimely end? We’ll have to wait until Sunday to see how this all plays out. 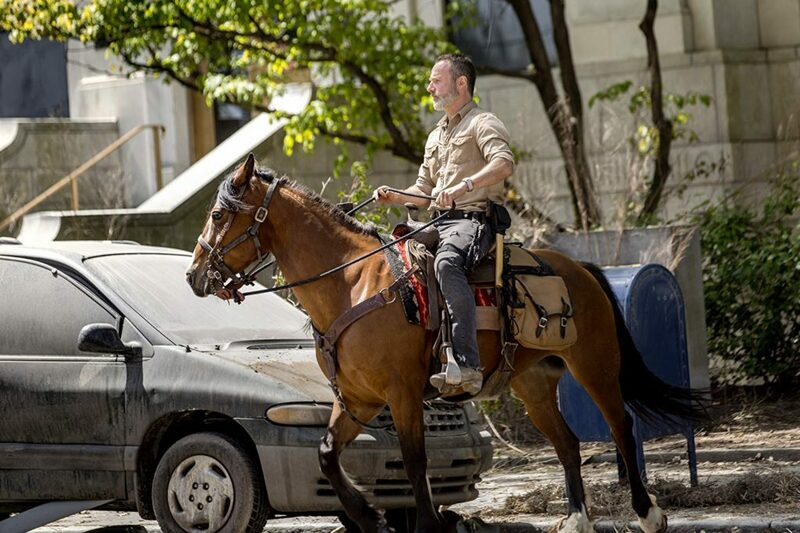 Maybe it’s a bit fitting to see Rick go out on horseback surrounded by walkers, just as we first saw him in episode 1, in Atlanta, though there he was led to safety by an ex-pizza delivery boy by the name of Glenn. Will someone miraculously come to the rescue at the last moment to save Rick? Or, knowing his character is leaving the show, is his death inevitable? 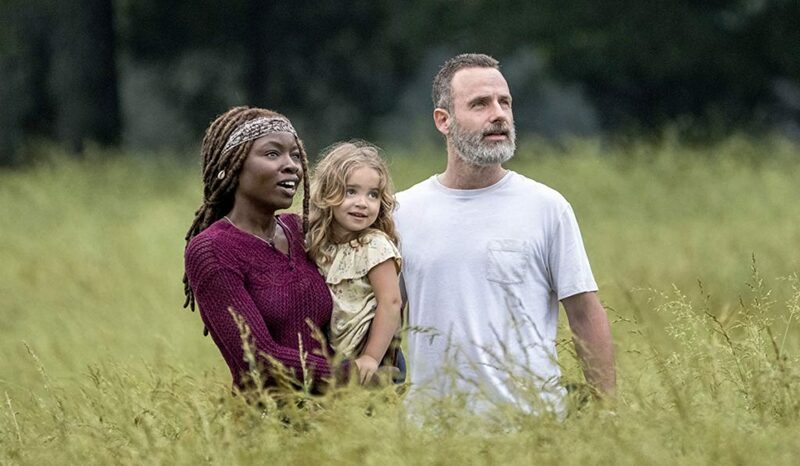 It’s hard to imagine Lincoln’s character leaving the society he’s worked so hard to build, as well as Michonne and little Judith. It seems as though death is the only reasonable conclusion for one Rick Grimes, but who knows? Maybe a surprise is in store. 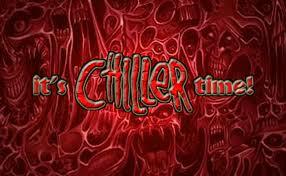 It’s difficult to think of the show without its heart and soul since the beginning. But if you recall in past seasons, especially the second half of season 4, where the group was split up after the Governor’s assault on the prison, Rick sometimes didn’t appear for a couple of episodes in a row a number of times. The show remained compelling, not just because of its post-apocalyptic premise, but because of all the other characters you had grown to love and care about. That remains the case now more than ever, with an extremely large cast of long-time favorites, like Daryl, Carol and Michonne, to newer ones like King Ezekiel, Jerry and Jesus. (Maggie is also said to be leaving, with the possibility of a future return, as Lauren Cohen has her own new ABC show, Whiskey Cavalier, on the horizon.) 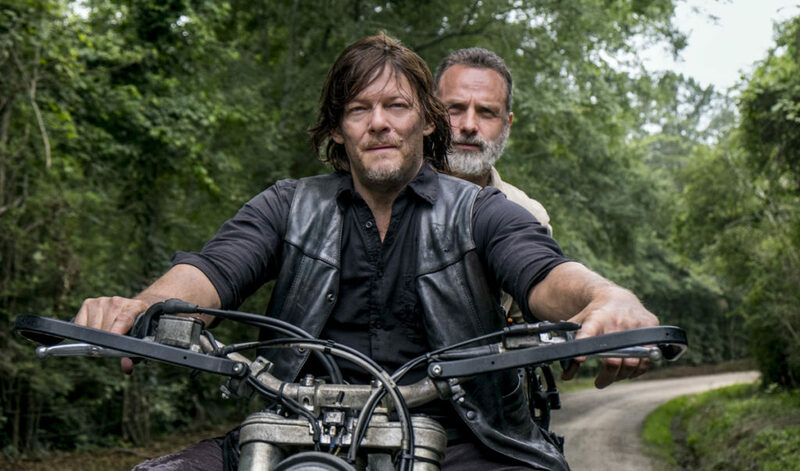 The Walking Dead will carry on, and maybe even be the stronger for it, opening it up for exciting new changes steered by new showrunner, but long-time Dead member, Angela Kang. As Rick still survives in the ongoing comics, it will be up to the producers and writers to figure it all out. Now, with the character of Daryl someone who never existed in the comics, the logical move would be to give him a large part of Rick’s workload. However, as Daryl has always been the more quiet, loner type who led by example, it will make for a marked difference from the page to the screen. While we all anxiously await with nerve-wracking anticipation how Rick ultimately leaves The Walking Dead, we will leave you with some special goodbyes from the cast and crew themselves, starting with this roundup by Entertainment Weekly of final words for Andy by those who’ve worked with him at various times during the run of the show. The Gore 4 would also like to express our sincere thanks to Andrew Lincoln for giving us eight plus years of one of the most complex, dynamic and thoughtful characters in the history of television. While we can’t know what the future holds for Lincoln or The Walking Dead, we do know that Andy’s presence and legacy will last ’till the very end of the show. He gave a performance that was worthy of several Emmys, one that forced his character to confront not only the demons, in the guise of the undead, and even the living, that existed in the world all around him, but also those demons within himself. Going beyond the basic struggle just to survive and forging ahead with hopes and dreams for a future where everyone could coexist peacefully, this despite facing insurmountable losses time after time, is what we’ll remember about Rick Grimes. That and those hundreds of zombies he killed along the way. Rick Grimes is the lens through which AMC’s legion of viewers watch The Walking Dead. Protagonist, Hero, Everyman — Andrew Lincoln’s portrayal of Rick Grimes was pivotal to the show’s enormous success. His journey became our journey. Although other characters (those who survived) have developed significance over the course of the series, Grimes was Magnetic North. The manner of his departure is as yet unknown, so the burning question is: Who will become the new fulcrum upon which the series shall rest? Fans of the show can only hope that whoever steps up to the plate will extend Rick’s legacy beyond Andrew Lincoln’s departure. Very well stated, Dave. This show has, essentially, been Rick’s journey from the very beginning. Over time, it has also become the journey of many others, with Daryl, Carol and Maggie around for just or nearly as long. It will be up to them and the rest to carry Rick’s torch for however long the show goes for. And as this show has continued to survive, and thrive, despite losing so many important, and beloved characters, there is no doubt that it will continue to do so once Rick is gone, though his influence and importance will nevertheless still be felt for years to come.